All LanPro plugs CAT 5e have 50 microns of gold plating over nickel alloy, assuring a long life and a high degree of resistance against corrosion and environment hazards. Patch panels are most generally found in Ethernet networks, making CAT 5e patch panels the most common model of all. A patch panel, sometimes referred to as a patch bay, is a panel designed for the easy management of cable connections. On the front side of a patch panel there are jacks designed to receive short patch cables, while on the back of the panel there are punch down blocks that receive the connections of longer and more permanent cables. The assembly of hardware is arranged so that a number of circuits appear on jacks for monitoring, interconnecting, and testing in a convenient and flexible manner. This provides the convenience of allowing technicians to quickly change the circuit of select signals without the use of expensive dedicated switching equipment. We offer rack mount as well as wall mount units. 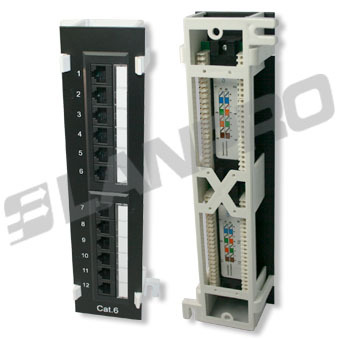 LanPro CAT 5e patch panels offer reliability, low cost and excellent performance. Available on 7000 Series for the budget conscious project, or 8000 Series with 45 degree dust free entry, and redesigned PCB for ultimate performance. The very original CAT 5 cable is a twisted pair high signal integrity cable type. Most CAT 5 cables are unshielded, relying on the twisted pair design for noise rejection. Now, Category 5 has been superseded almost universally by the Category 5e (CAT 5e) specification structured cabling for computer networks such as Ethernet, and is also used to carry many other signals such as token ring, ATM (up to 155 Mbps), and even on basic voice services. LanPro offers different types of CAT 5e cables, being among the most popular the solid UTP with CM or CMX jacket for ultimate protection against flame propagation and low toxic fumes. 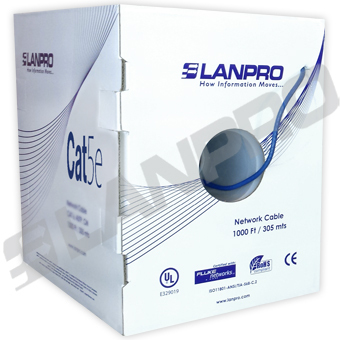 LanPro CAT 5e comes in 100 m small spools or the traditional 1000 ft easy-pull boxes. 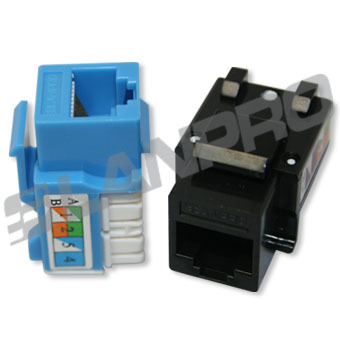 The LanPro 8P8C (8 Position 8 Contact) unshielded keystone jack is a modular connector used to terminate network cables. These connectors are commonly used for Ethernet over twisted pair, registered jacks and other telephone applications, RS-232 serial using the EIA/TIA 561 and most standards, and other applications involving unshielded twisted pair, shielded twisted pair, and multi-conductor flat cable. 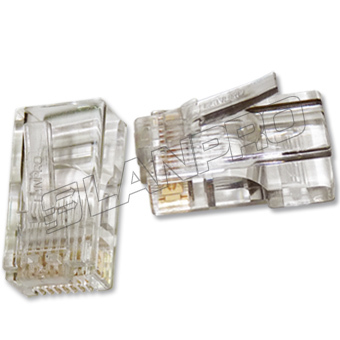 This CAT 5e RJ45 Keystone Jack supports both T568-A and T568-B wiring and uses the industry standard 110 interface. The LanPro CAT 5e keystone jacks are designed to work with a wide variety of LanPro panels, boxes, modules and Snap-In Wall Plates. Also, the modular and standard design is compatible with the most recognized high-end brands available on the market. All of our keystone jack housings are made of high temperature thermoplastic. Also, the contacts are made of phosphor bronze material with 35 microns or more layer of plated gold. Our jacks accept 22 to 26 AWG solid wire and insulation diameter from 0.4 to 0.6mm Easy to be terminated, resulting with minimum attenuation characteristics. They are available in six vivid colors. LanPro offers two large families of keystone jacks: the budget conscious 7000 Series and the ultimate performer 8000 Series, with US and Canadian certifications. Both families offer two degrees of shielding capabilities; the popular unshielded and state of the art fully-shielded. 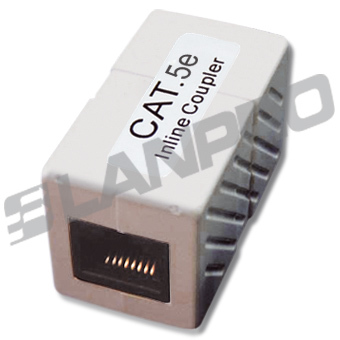 The LanPro In-Line Couplers CAT 5e by LanPro allow you to connect diverse patch cords without reducing the performance of the link / channel. 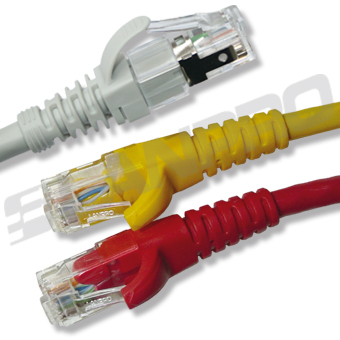 LanPro patch cords, in unshielded and fully shielded versions, are manufactured with very flexible cables, which translates into easy handling. The use of hot-molded "snagless" boots and strain relief on the cable and plug avoid the damage to the plugs locks when handling the cables in dense installations. Eight bright colors that don´t cause confusion, with UV additives to diminish the color fading along the years because of UV radiation. Our hot-molded strain relief on the cable provides very high mechanical strength, assuring long life and many years of use and abuse.